So I don’t know that much about the Mecha genre, and, personally, I find it hard to see the appeal some times. I’ve seen SDF Macross, RahXephon, Code Geass, and an episode of Buddy Complex for an Impressions season. Regardless of what I watch that involves giant fighting robots I still find it hard to get into unless there’s something else going on. Maybe I can fix that with this reader request I have this week. 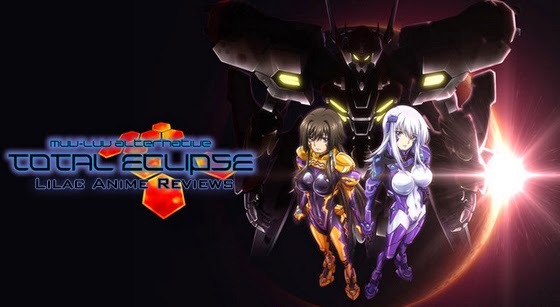 Muv Luv Alternative: Total Eclipse is a 24 episode Action/Mecha series originally based on the manga by Ukyou Takao and published by MediaWorks in 2002. Since then, video games and spin off manga were released between 2003 and 2011. Currently there are two ongoing manga Alternative and Alternative Total Eclipse, both from MediaWorks. As for the series itself, it is from studio Statelight and directors Tatayuki Inagaki and Masaomi Ando for the Summer 2012 season. As of this review it is licensed for legal streaming in the states thanks to Crunchyroll. In 1973, an invasion of aliens known as BETA appear upon Earth and are driving human civilization into near collapse. Facing an enormous mass of enemy force, mankind has developed large humanoid arms called Tactical Surface Fighters and deployed them to its defense lines throughout the world. All these efforts have slowed down defeats, but can not stop the BETA, and mankind is forced to abandon a major area of the Eurasian Continent. For 30 years, mankind is bogged down in an endless war against BETA without any hope of victory. In 2001, Imperial Japan faces difficulties in the development of a next-generation main Tactical Surface Fighter (TSF) as it defends the front lines of the Far East. The UN has proposed a joint development program between Japan and the United States as a part of its international mutual development project of TSF, the Prominence Project. 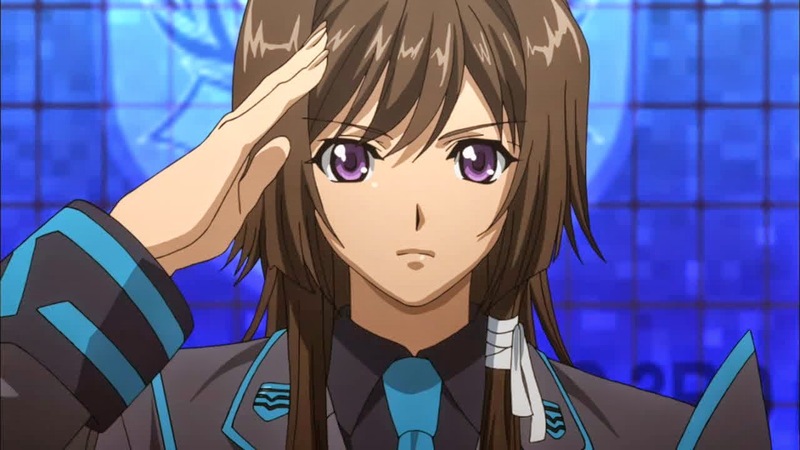 Yui Takamura, a TSF pilot of the Imperial Royal Guard of Japan, is given responsibility for the project and sets off to Alaska. 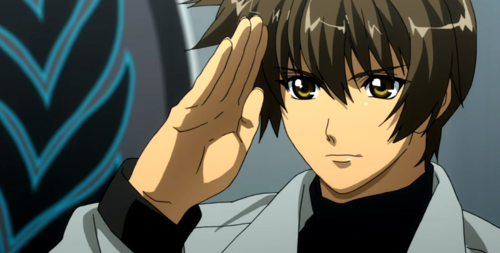 Meanwhile, Yuuya Bridges, also a TSF pilot of the US Army, is headed for the same destination. Sure, but where else will we get the fan service?!?!?! Something I wanted to look into this time was the studio that’s behind the series so I can get a better picture of their work. In this case, Satelight. This studio has been around for quite some time, since 2001, and have worked on many series but few that I’ve actually seen. The major ones I see right away that I know are the first few episodes of Hellsing Ultimate and some of their more recent works Log Horizon and Nobunaga the Fool, both of which I didn’t keep up with and were dropped during their respective Impressions seasons. But what to say about Muv Luv? Well, I will give credit to the action scenes as they are well done along with some other combat moments that were graphic enough to get the point across but are not an all out gore fest because it did have potential to go that far. There are moments were consistency in character designs dies a little as they attempt to create comic effect but those moments are really few. As for the soundtrack it’s extremely generic and I would not be surprised if it was a copy/paste situation here. The music just screams “I’M AN ACTION SHOW!! OH MY GOD HI THERE!!! NOTICE ME SENPAI!! !” .........Yes I just made a senpai joke......... That’s how bad this is right now. Oh! And shower scenes! Don't forget about those!! Something that tends to bug me when it comes to the Action genre, and more specifically the Mecha genre, is that many of the stories are rather similar. Sure you get a few gems like RahXephon and Code Geass, but that’s because they offer much more then the typical giant robots fighting other giant robots such as strong characters, psychological effects, well developed love stories, etc. It’s why these are more well known then most other mecha series. In the case of Muv Luv, it attempts some of these methods but the story really bogs it down. The story suffers from many stereotypical plot points and moments that make little to no room to try and be a unique show. 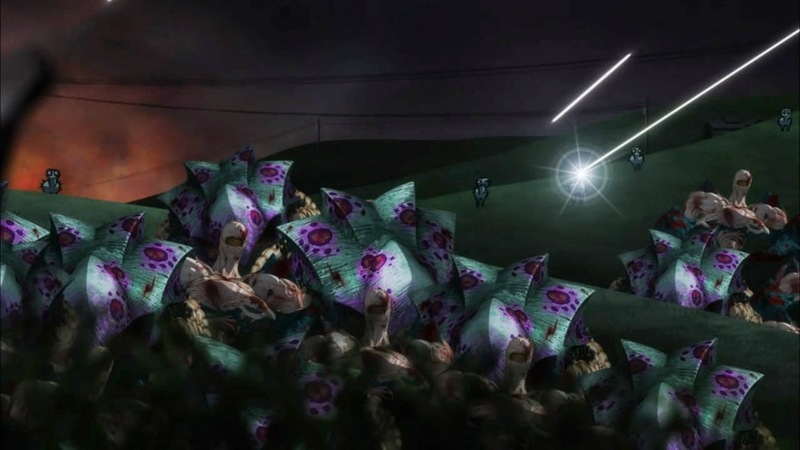 Quickly running down the list of typical troupes we see in Muv Luv there’s an alien invasion/war as the major conflict, struggles of characters and their pasts, growth of major characters along the way with training, and a double whammy with a beach AND hot springs episode! TA DA!! This part of the series got in the way so much that once we head towards the final five or six episodes we suddenly get a completely different plot line that doesn’t fit the overall story. Which is really saddening because these final episodes actually had an interesting story that was different then what I’ve seen from the Mecha genre thus far. It’s just too bad that it’s only a short arch and couldn’t have been longer and with a better ending. The final episode just kinda puts a stop to the arch and then spends ten minutes or so loosely wrapping things up and strongly hinting at another season. It really does need another season because there are some parts left unanswered and it’s really irritating. ....Then maybe we'd get something much more! Similar to the story, the characters are rather cliched and stereotypical. Granted it’s a nice mix of personalities, not just nationalities, but I still can’t get over how basic these characters are. There are, at least, three exceptions to this and that’s Yui Takamura and the Scarlet Twins, Cryska and Inia. Though this exception is rather slim, like parts of the story, it gave me a bit of fresh air. The back story for these characters is actually rather interesting in their development and goes back to other mech series standing out more because of interesting characters. 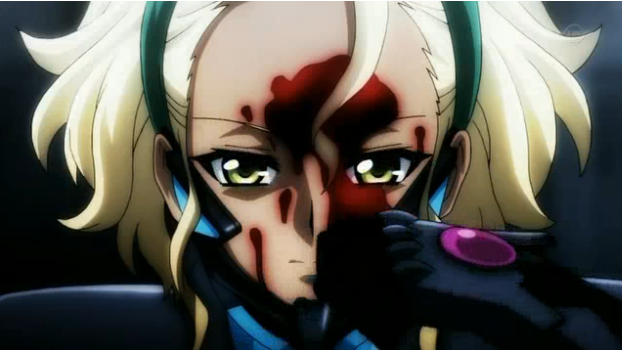 But as interesting as Yui, Cryska, and Inia are they too suffer from some classic troupes that you see in other series and, even more so, in fiction and media today. Particularly Cryska and Inia have a classic “more than just a creation” troupe that can be found in other familiar works like Frankenstein. As for Yui, the first two episodes involve her backstory and it was confusing to me because once episode three came I thought I was watching the wrong anime. I understand the need to provide Yui’s story as it is a strong part of her character as a whole, but placing it as the first couple of episodes seems a little jarring to me. The time lapse occurs between episodes two and three, no hint during an episode or anything. This may be more of a product of director as Inagaki directed the first two episodes only with Ando taking over from episode three onwards. Overall, there’s not a lot to say about the characters because nearly all of them are riddled with cliches and stereotypes, with the only real interesting ones, in my opinion, being brought down by those common troupes. As of this review, there is no dub with the likelihood of there ever being one rather slim. So we’re going to be relying on the lovely Japanese performances today! This cast is extremely diverse with rather solid performances. Just like when I reviewed Ben-To, they did well with what source material they had. Daisuke Ono and Mai Nakahara play off each other really well as Yuuya and Yui giving me the most enjoyable interactions even with the cliched character types. Sakura Nogawa, Sayaka Ohara, Kenji Hamada, and Tomokazu Sugita breathe some life into our group of secondary characters Tarisa, Stella, Valerio, and Vincent giving it some extra kick to even more cliched moments; mostly in regards to love. 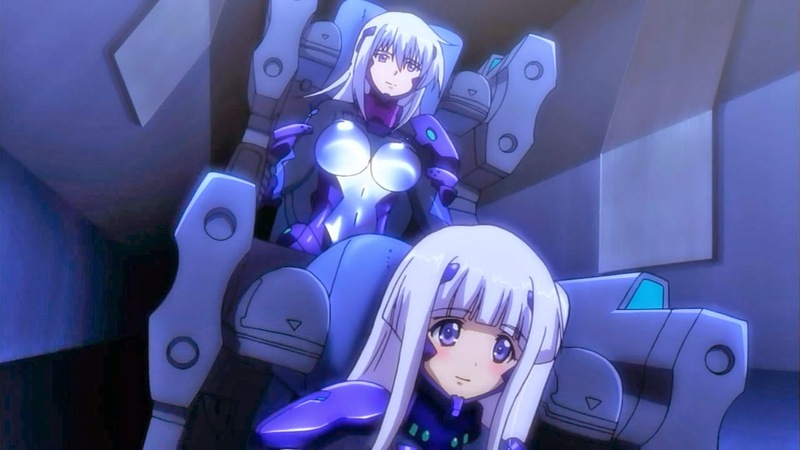 Hitomi Nabatame and Mamiko Noto as Cryska and Inia are probably my favorite of the performances, but that’s mostly because of the story behind these characters. I just can’t go into every single performance there is because there are so many and each one is just as important to the series as the next. So, overall, lovely job from the cast! 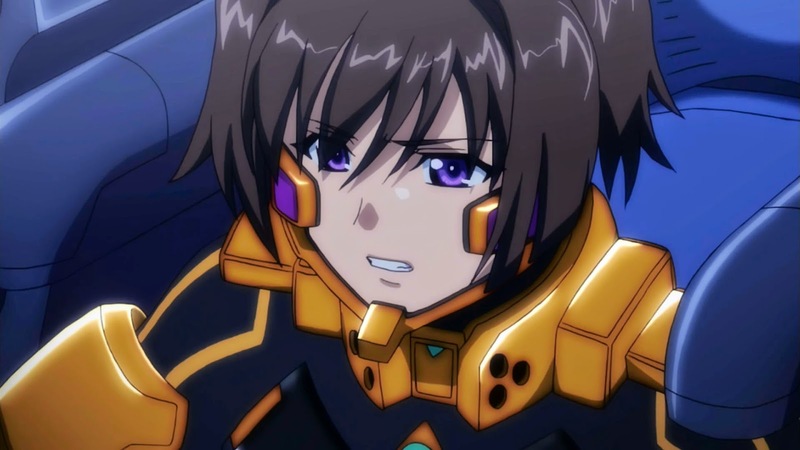 By the end of the battle, Muv Luv Alternative: Total Eclipse can be pulse pounding action when it wants to be, but doesn’t do anything the break away from the typical mold like some of its predecessors in the same genre. There are some interesting characters and side plots but they are completely overshadowed by a generic story, and by the time the climax comes around it’s completely out of left field. Not only that, but the series comes to a rather hasty halt with the promise of a second season slowly becoming slimmer by the day. If you like action series with some fun moments and running gags then give Muv Luv a try. But if, you’re like me and, you want something more then just typical mecha fare then you won’t miss much if you skip this one. Next time, it’s time to tackle one of the most well known and classic anime films of all time. Until then, otaku on my friends! Final Rating - 4/10 It tries to be different... It really does.... Too bad the cliches held it back. Special thanks to Bukkiteer FriedrichNietzche for the request! Did you know you can shorten your links with AdFly and make $$$$$ for every click on your shortened links.